State of the Wild is a biennial series that brings together international conservation experts and writers to discuss emerging issues in the conservation of wildlife and wild places. Each volume in the series combines evocative writings with a fascinating tour of conservation news highlights and vital statistics from around the world. One-third of each volume focuses on a topic of particular concern to conservationists. 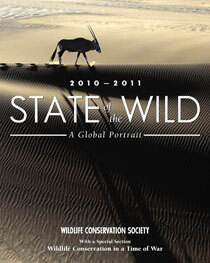 This 2010–2011 edition considers how destabilization and war affect wildlife and wild places. Only recently has the international community begun to appreciate the cost of conflict—simmering tension, war, and reconstruction—on the natural world. This special section examines the role that conservation plays in the context of human conflict considering issues such as, Can the work of saving wildlife and wild places help ameliorate tensions? Can conservation deepen political understanding? Can conservation help in post-conflict situations? The book’s twenty essays are intermixed with poetry and beautiful photos that capture our connection to the wild. "This unique publication blends poetic awe for nature's beauty with rigorous analysis of the most difficult challenges conservation faces. Discussions range from new discoveries in biodiversity science, to profound reflection on conservation in times and areas of war, to novel field techniques and approaches. This stunning book is informative and inspiring. Every conservationist should read it." "In times of war, it is easy to forget about the indispensible role natural resources play in supporting human livelihoods. This book reminds us of the toll war takes on wildlife and the challenges of conservation in conflict zones. It is an excellent summary of the latest conservation science and draws on important case studies of both success and failure. A source of inspiration for practitioners and policy makers alike, this volume makes an important and timely contribution to the global body of knowledge on the state of the wild." "This edition of the State of the Wild, with its emphasis on conservation in a time of war, puts to bed the misguided notion that natural resources are luxury items to be conserved once fighting has stopped and stability returned. Chapters in the special section uncover the diverse roles conservation plays during conflict, including key contributions to ending conflict, supporting livelihoods, and ultimately building peace. While such contributions are not easy to make, nor their results guaranteed, they offer a means to minimize the threats and grab the opportunity." -What Future for Forest Elephants? -Conservation Controversy: Can Paying for Ecosystem Services Save Biodiversity?